Interview (in Dutch): Mariëtte Woudenberg, PuurTaal. English translation: Iain de Jong. Playing with LEGO®. Are you being serious…? 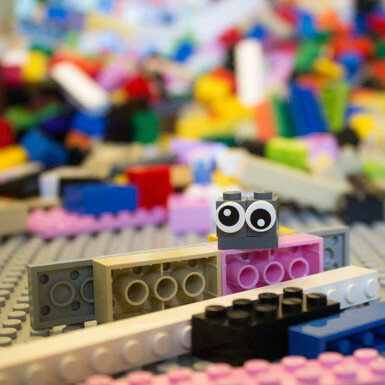 Though it may not seem logical at first, playing with LEGO® bricks genuinely awakens something within people, according to Kaj ten Voorde (1981). It’s even part of a real methodology. ‘When you build with your hands,’ Kaj explains, ‘something happen in your brains. Scientific research has demonstrated that it sets a whole process of thought into motion and strengthens your ability to reflect.’ For this reason it’s not surprising that LEGO® SERIOUS PLAY® is rising in popularity. First, let’s clear up a misunderstanding: Kaj is not a LEGO-fanatic. He used to play with them as a kid, but definitely not in a super dedicated way. And what about YouTube-clips of the huge constructions that you can make with the blocks? Frankly, they don’t really excite him. His passion lies in the practical application of LEGO® in working with organizations, schools and communities of faith. Beta, but also alpha. His two sides define Kaj ten Voorde as a person. Like the fact that his faith is the foundation upon which he lives and works. Kaj grew up in a Christian home and made the conscious decision to follow Jesus as a teenager. Since then, it has played a central part in his life. Also when he works with churches as a facilitator and trainer. After his studies at CHE (Christian University of Applied Sciences Ede) – thanks to a crowdfunding campaign – he was able to translate his thesis into English and follow a LEGO® SERIOUS PLAY® training. He may now officially call himself a facilitator. With the Making of Meaning, Kaj has already received several calls for assistance from organizations, schools and communities of faith, and he has also provided workshops for group leaders to make them aware of the methodology.